Modern Healthcare reported Friday that the state was planning to file the request this week. Under Iowa's state innovation waiver request, residents would receive premium subsidies based on broad age and income categories, without using the Affordable Care Act's calculation to cap premium costs at a certain percentage of a person's income. The state revenue department would determine a person's eligibility and level of subsidy, rather than having that determination made by the federal exchange. Another change is that people earning more than 400% of the federal poverty level would be eligible for premium subsidies. Meanwhile, people with incomes from 138% to 250% of poverty would no longer receive cost-sharing subsidies to reduce their deductible and coinsurance payments. The state would use a portion of the federal subsidy money to set up a reinsurance program to protect insurers that sign up high-cost enrollees. In an interview, Iowa's Republican-appointed insurance commissioner, Doug Ommen, said the proposed redistribution of federal subsidy dollars is necessary to make premiums more affordable for Iowans of all income levels and dissuade them from dropping insurance. That, he argued, will stabilize the market and reduce premiums by keeping healthier people in the risk pool to offset the costs of sicker people. Otherwise, nearly 20,000 mostly healthy Iowans out of the 72,000 people currently in the ACA-regulated individual market are likely to drop coverage, which would drive premiums even higher, he warned. "The market is clearly in collapse," Ommen said, noting that families who don't currently qualify for ACA tax credits otherwise could face annual premiums of nearly $40,000. "We wanted to do what was necessary and appropriate to maximize participation at all income levels. It's not sustainable without healthy folks." But outside experts say eliminating cost-sharing reductions would make healthcare unaffordable for lower-income people, who would face a $7,350 per-person deductible under the Iowa waiver proposal. The state's proposed standard plan would also charge copayments for various services—such as $400 for advanced imaging and $10 to $300 for prescription drugs—though it would not charge any co-insurance percentage. Nearly 28,000 Iowans received cost-sharing reductions last year, which can reduce the annual deductible for lower-income people to around $200. "The hardest hit will likely be the sickest people, who could find it more difficult to afford medical care and prescriptions," said Karen Pollitz, a senior fellow at the Kaiser Family Foundation. Boosting out-of-pocket costs could shrink enrollment among lower-income consumers. "Their assumption is that low-income people will continue to enroll at the same rate," said Tim Jost, an emeritus law professor at Washington and Lee University and an authority on the ACA. "But that doesn't make sense. Why would a person with an income of $15,000 enroll in a health plan with a deductible of ($7,350)?" Ommen defended the proposed elimination of cost-sharing reductions by arguing that the state's overall plan would reduce premiums for lower-income consumers. "By significantly reducing premiums, that gives them more money to cover their cost-sharing," he said. But Pollitz said people in the population with incomes of 138% to 250% of poverty already receive large federal tax credits and thus pay little or no premium. So the state's waiver effort to bring down premiums overall would do little to help that income group afford large, new out-of-pocket costs. Iowa hopes HHS will approve the waiver on an emergency basis because only one insurer has offered to sell ACA-compliant plans in the state for 2018. That insurer, Minnesota-based Medica, proposed last week to raise its rates by 57%. Wellmark Blue Cross and Blue Shield said it would reverse its decision to exit Iowa's exchange market in 2018 if the waiver is approved. Experts say Iowa's insurance market problems have been partly self-inflicted, worsened by the state's decision to allow continued sales of health plans that are not compliant with ACA rules. That has kept about 85,000 Iowans, who are thought to be generally healthier, in a risk pool that's separate from the ACA-regulated pool. While Ommen didn't deny this issue, he said the state could not ask people in noncompliant plans to switch to ACA-compliant plans and suddenly pay much higher premiums. 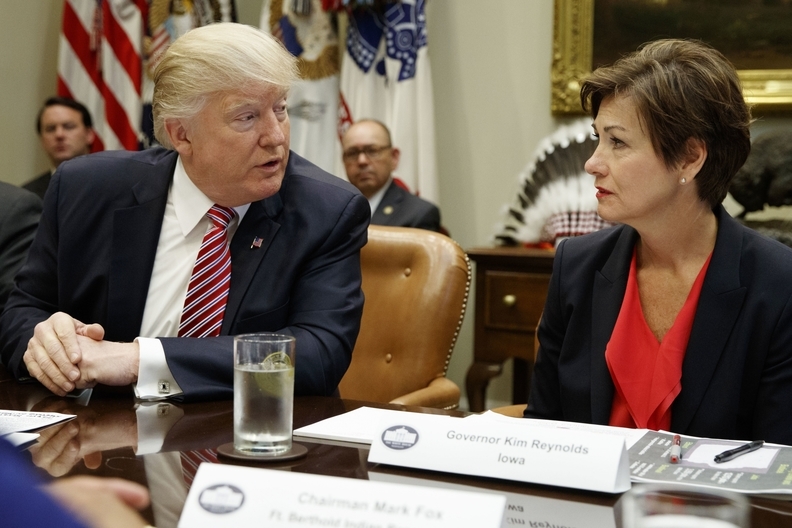 It's widely expected that if the Trump administration approves Iowa's 1332 waiver request, other states soon would follow with similar proposals. That could enable them to sidestep some of the ACA's consumer protections that congressional Republicans have been trying to loosen or eliminate in their repeal-and-replace bills. A CMS spokesperson said if the CMS and the Treasury Department find Iowa's waiver application complete during a preliminary review within 45 days of submission, they will provide a public notice and comment period. The agencies' final decision will be issued no later than 180 days after that determination of completeness. But some experts predict Iowa's proposal could face legal challenges. Those could arise based on the so-called guardrails in Section 1332 of the ACA requiring state innovation waiver plans to cover at least as many people with benefits that are as affordable and comprehensive as offered by the ACA exchanges. "It's very possible that a person in Iowa with an income of 150% of poverty who's currently receiving generous tax credits and cost-sharing reduction payments would have standing to file a lawsuit if those were eliminated to reduce premiums for higher-income people," Jost said. Ommen, however, said he isn't worried. "We've met the guardrails, and we believe our request is fully within (HHS' and the Treasury Department's) range of discretion," he said. He acknowledged that the Iowa Stopgap Measure isn't the perfect solution, but argued that the state can't afford to wait for Congress to pass legislation to stabilize the individual market. "Congress needs to fix it or send flexibility back to the states," he said.